How to Fix Amazon Cloud Drive Not Syncing Problem? How to fix Amazon Cloud Drive not syncing issue? You probably look for the best Amazon Cloud Drive sync tool-AOMEI Backupper Professional to sync files to Amazon Cloud Drive automatically for Windows 7/8/10 users. Amazon Cloud Drive refers to Amazon Drive, which is a cloud storage application developed by Amazon, it offers secure cloud storage, file backup, file sharing and photo printing. And you can transfer and manage the files and folders among multiple devices, including mobiles, tablets, and desktop applications. The videos and music files are also allowed to upload. Before using Amazon Cloud Drive, you have to sign up Amazon.com account and install Amazon Cloud Drive on your computer. A user complained about Amazon Cloud Drive does not sync like this: I want to use Amazon Cloud Drive to sync my files to the cloud, but there is no synchronization available, the Amazon Cloud Drive has only an upload to transfer files on Desktop application. I don’t want to keep uploading 1500GB repeatedly. It’s a waste of time. Why Amazon Cloud Drive not syncing? How can I automatically sync files to Amazon Cloud Drive without uploading? Why Amazon Cloud Drive Not Syncing? Although, Amazon Drive attracts many users to transfer and manage their documents. In this case, it is not difficult to find that Amazon Drive has some limitations for personal use: Amazon Cloud Drive does not provide file syncing. So they can’t sync the latest version of documents to the Amazon Drive. How to fix Amazon Cloud Drive not syncing problem in Windows 7/8/10? How to Synchronize Files to Amazon Cloud Drive Automatically? 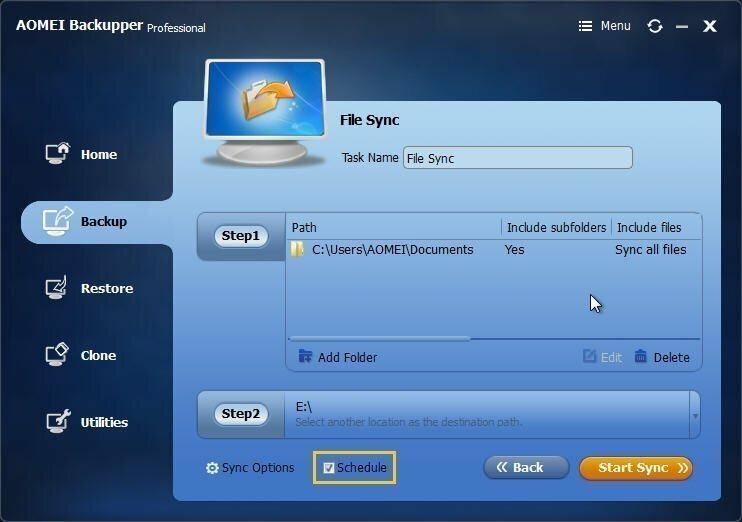 As a matter of fact, in addition to Amazon Cloud Drive, you can turn to the best Amazon Cloud Drive sync tool-AOMEI Backupper Professional, which is a professional file syncing software for most popular operating system, like Windows 7, 8, 10. It is capable of real time files/folders syncing and automatic files/folders sync to local hard drive, external hard drive, NAS devices, network share, CD/DVD and clouds, etc. Now, follow me to synchronize files to Amazon Cloud Drive automatically with AOMEI Backupper Professional edition to repair Amazon Cloud not syncing problem. First, you may have to download AOMEI Backupper Professional to have a try. 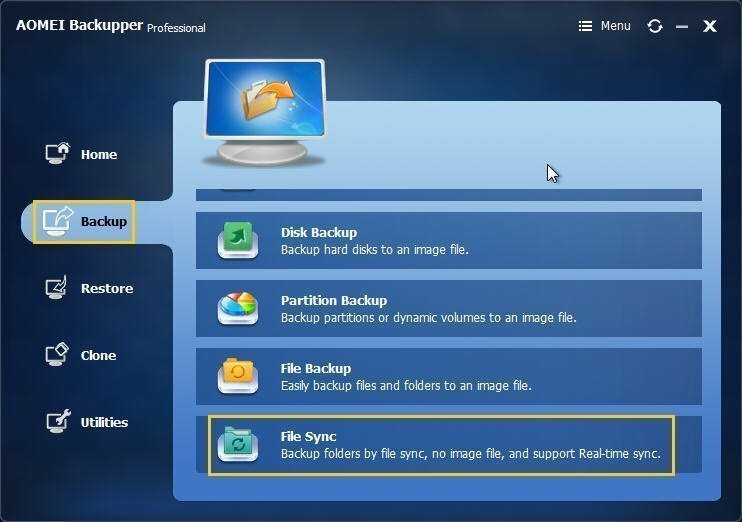 1, Launch AOMEI Backupper Professional, at the left column, select Backup, then choose File Sync. 2, Input a proper name into Task Name box in next window. 3, Click Add Folder to select the specific files or folders to sync in the Step1. 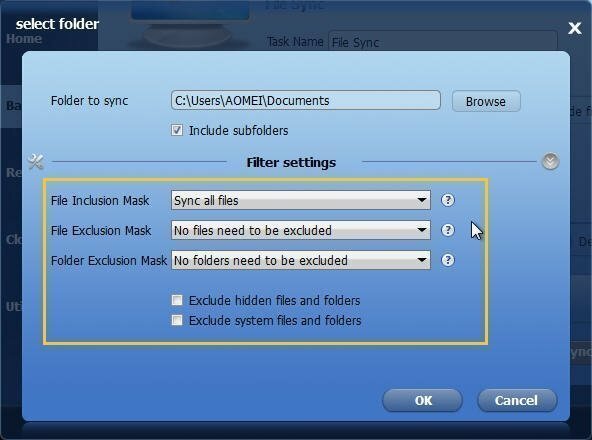 Tips: You can customize the files you want to synchronize with Filter settings. 4, Select Amazon Cloud Drive as the target to save the files or folders in the Step2. 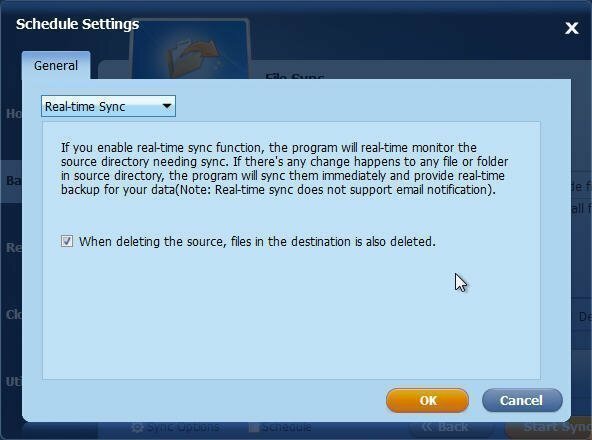 Tick Schedule to select Real-time Sync option to synchronize files/folders. 5, Press Start Sync to sync files to Amazon Cloud Drive automatically. You could sync multiple files and folders to cloud drive at once. Furthermore, AOMEI Backupper Professional allows you to clone operating system (OS), partition and entire hard drive to cloud, merge backup images, restore system to dissimilar hardware computer, create event-triggered schedule backups and command line backup, etc. You will find the best way to do backup and restore operations.